← Cheer up, it’ll soon(-ish) be Spring! Greetings to my loyal followers from underneath the January Linus blanket (large, warm, covers me all over). Since I am currently dealing with protracted computer hassles of mind-frying tedium, I have not got a post ready this week. Don’t go away! To keep you entertained as January grinds on, steeped in recession with the spectre of inflation looming and political disruption ramping up across the globe (do I exaggerate? I think not…. ), here are two of the UK’s funniest comedians being consummately ridiculous – courtesy of YouYube, via my husband Ian. Enjoy! 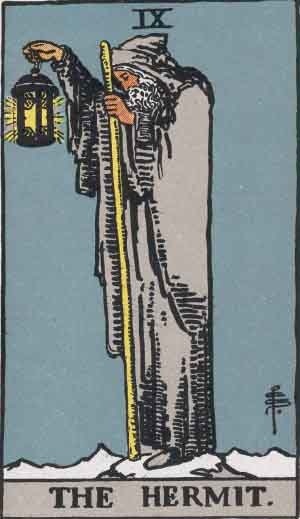 The Hermit, that's me in January!! This entry was posted in Humour - video clips etc and tagged Anne Whitaker, Blackberry, computer hassles, inflation, Linus blanket, political disruption, recession, Tarot Hermit, www.flixxy.com, YouYube. Bookmark the permalink. I’m such a computer hater that I’ve only just looked at your great summary of computer problems. But, not being a nerd, I’m very aware that blackberries (and apples that haven’t had some kind of special storage that I don’t like to think about) are out of season for a good many months yet. Is that the problem? Do you know, I think you may have cracked it!